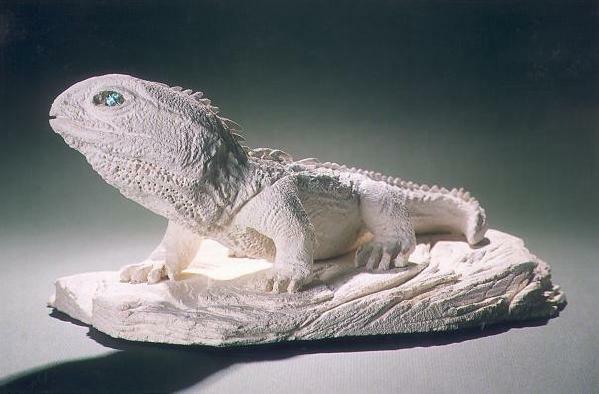 This Oamaru Stone tuatara is on of my most detailed stone sculptures. After slowly carving the frame, I worked with a dremel multi tool, using the engraving bits, over a period of time to create the texture of scaly skin. I then shaped and added paua shell into the eye to give a dramatic effect. These creatures are a native reptile only found in Aotearoa, New Zealand. Don't know what a dremel is? A Dremel is a mini high speed drill (like a dentist drill) that you can use for any number of projects. There are many dremel tool accessories that you can buy. People use a dremel to engrave, polish, sand and cut anything from plastics to metal. It is a very popular tool for bone carvers.